Elizabeth Kenny – Australian Bush nurse. Australian nurse and health administrator, Elizabeth Kenny was born in Warialda, New South Wales, in 1880, the daughter of Australian-born Mary Kenny, née Moore, and Michael Kenny, a farmer from Ireland. She was known for her alternative approach to polio treatment, known as the Kenny method. Her method differed from the then conventional medical practice which called for placing affected limbs in plaster casts. Instead, Kenny applied hot compresses to affected parts of patient’s bodies followed by passive movement of those areas to reduce what she called “Spasm.” Kenny’s principles of muscle rehabilitation became the foundation of physical therapy or physiotherapy. After much study, she concluded that the stiff muscles had to be loosened if the effect of the disease is to be reduced. The procedures followed by her in revitalizing the muscles are the basis of physical therapy which later came to be known as modern physiotherapy. Though her techniques were at odds with the general medical concept of treating polio, she carried on with her methods and was able to treat more than 3000 patients successfully in Australia alone. Her methods were used to treat hundreds of other patients throughout the world. Despite no formal medical education or training in nursing, her methods impressed many doctors throughout the world. She was the first woman in a ten year period to have displaced Eleanor Roosevelt from the number one position in the ‘Gallup Polls’. A film named ‘Sister Kenny’ was brought out in 1946 which tells her life story, her struggles, and her ultimate successes. Kenny was portrayed by Rosalind Russell, who was nominated for the Academy Award for Best Actress for her performance as Kenny. 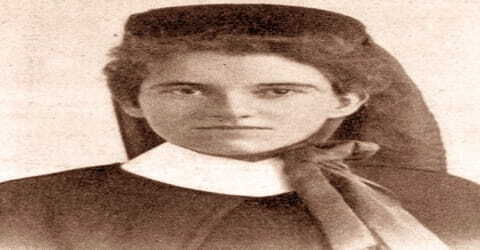 Elizabeth Kenny, also known as Sister Elizabeth Kenny or Sister Kenny, was born on September 20, 1880, in Warialda in New South Wales, Australia. Her father was Michael Kenny an Irish farmer settled in Australia, and her mother was Mary Moore and Australian native. She was called “Lisa” by her family and was home-schooled by her mother before attending schools in Guyra, New South Wales, and Nobby, Queensland. She received little formal education, although she was an avid reader and had a keen interest in medicine and human anatomy. Encouraged by Aeneas McDonnell, a surgeon in Toowoomba who had treated her for a broken wrist, Kenny decided to pursue her interest in medicine, volunteering at a hospital in Guyra, N.S.W., and developing a working knowledge of nursing. Although she was not a registered nurse, about 1910, while living with her family at Nobby, in Darling Downs, Queens, she initiated her own nursing practice, traveling by horseback, and later by motorcycle, to visit patients. Following that she worked in the kitchen in “Scotia,” local midwife’s cottage hospital, and local Dr. Harris gave her a letter of recommendation. With part of her savings from her Brokerage work, she paid a local seamstress to make her a Nurse’s uniform. With that, and the observations she had at Scotia, and from her time with Dr. Harris she returned to Nobby to offer her services as a Bush Nurse. At that time she was known as Nurse Kenny. She earned the title “Sister” while nursing on cargo ships which carried soldiers to and from Australia and England during WW I. In Britain and Commonwealth countries, “Sister” as a title of courtesy applies not only to members of a religious order but also to a more highly qualified nurse, one grade below “Matron”. Elizabeth Kenny had adopted a daughter named Mary Stewart who went on to become one of her top researchers. 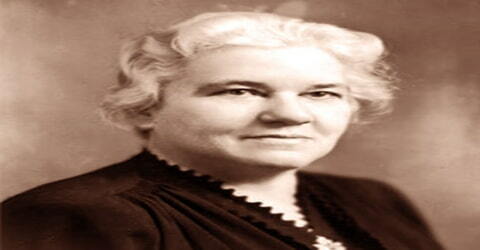 She devoted her whole life treating people afflicted by diseases like meningitis, polio and cerebral diplegia. From the age of 18 up to her mid-twenties, Elizabeth Kenny worked as a bush nurse in the district of Clifton. Kenny returned to Guyra in New South Wales in 1907 where she received basic nursing training from a midwife. During her stay in Guyra, she became a broker of agricultural products between the farmers and the markets situated in Brisbane. After her 1909 return to Nobby, she worked as a bush nurse reaching her patients on foot and often by horseback. But soon she opened a Cottage Hospital at Clifton she named St. Canice’s, where she provided convalescent and midwifery services. In 1911 she treated what Dr. McDonnell thought was infantile paralysis, under the supervision of Dr. Horn, the local Lodge Doctor. Polio, also known as infantile paralysis, was a devastating disease in Kenny’s time, with muscle fatigue and spasms in the limbs causing severe pain in many of its victims. When Kenny first encountered children with the condition, she was unsure how to relieve their suffering. On the basis of a recommendation by McDonnell, she decided to use heat as a pain-relieving measure. Finding that dry heat and linseed poulticing provided little comfort, she next tried damp heat, laying strips of hot moist cloth over affected areas, which appeared to reduce pain in some patients. This approach formed the basis of the Kenny method, which was later adapted to include physical therapies such as the bending and flexing of joints for rehabilitation. The story was romanticized in the 1946 film Sister Kenny, featuring Rosalind Russell. In her autobiography, Kenny wrote that she sought Dr. McDonnell’s opinion. He wired back, “…treat them according to the symptoms as they present themselves”. Sensing that their muscles were tight, she did what mothers around the world did: applied hot compresses made from woolen blankets to their legs. Kenny wrote that a little girl woke up very much relieved and said, “Please, I want them rags that well my legs”. Several children recovered with no serious aftereffects. There were several published versions of this story, one in Victor Cohn’s 1975 biography, one in Ostenso’s, and one in Kenny’s hand-written autobiography. The most dependable one, however, is most likely in a letter to Victor Cohn from Toowoomba journalist T. Thompson. Many years passed before Kenny treated anyone else who might have had polio. In 1913 Kenny opened a small hospital in Clifton at Darling Downs, where her method of polio therapy was reportedly used with success. However, two years later she sold the hospital, went to see McDonnell (who at her request wrote testimonials of her nursing experience), and booked passage on a ship to England, determined to join the Australian Army Nursing Service (AANS). Although only registered nurses could join the AANS, after a monthlong trial period Kenny was accepted into the service. 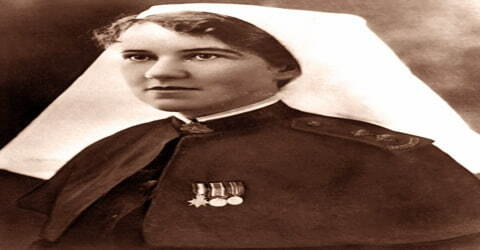 During World War I she served as a staff nurse on troopships carrying wounded soldiers back to Australia. In 1915, Kenny volunteered to serve as a nurse in the war. She was not officially a qualified nurse. Nevertheless, nurses were badly needed so she was assigned to work on “Dark Ships,” slow-moving transports that ran with all lights off between Australia and England. They carried war goods and soldiers one way, and wounded soldiers and trade goods on the return voyage. Kenny served on these dangerous missions throughout the war, making sixteen round trips (plus one around the world via the Panama Canal). Kenny was given the honorary title of ‘Sister’ in 1917 and from then on referred to herself as Sister Kenny, the equivalent to the rank of ‘First Lieutenant’ in the ‘Australian Army Nurse Corps’ for her service during the war. She served as ‘Matron’ in the ‘Enoggera Military Hospital’ located in Brisbane for some weeks but discharged honorably in 1919 due to illness. In 1919 she established a temporary hospital in Nobby to care for patients during the influenza epidemic. Although exhausted by her war service, Kenny set up and supervised a temporary hospital in her hometown Nobby to care for victims of the 1918 flu pandemic. When the epidemic subsided, Kenny traveled to Guyra to recuperate. Yet still exhausted and sick, she decided to go to Europe where doctors did help. Then she returned to Nobby, but within days she was summoned to Guyra by a girlhood friend to care for her daughter Daphne. She was disabled with what was known then as cerebral diplegia. Kenny treated her on the Cregan’s Station west of Guyra for three years and continued her association with her for many years. Her treatment of Daphne, plus nursing of sick and wounded men during World War I provided Kenny the experience for her later work rehabilitating polio victims. In 1927 Kenny patented the Sylvia stretcher (named for the first woman who was carried on it) for ambulances and in 1932–33 opened a clinic in Townsville. However, following a government-sponsored demonstration of her polio-treatment method, trained medical professionals became increasingly outspoken in their criticism of her practices, which ran counter to the standard immobilization techniques (e.g., splints and braces) that were used to prevent skeletal and muscular deformity. Despite the opposition, the Queensland government allowed Kenny clinics to open. In 1929 she nursed a disabled girl named Maude from Townsville using her own techniques to fight the disease and was successful in making her walk in 18 months. In 1932, Queensland suffered its highest number of polio cases in 30 years; the following year, several local people helped Kenny set up a rudimentary polio-treatment facility under canopies behind the Queens Hotel in Townsville. In a few months (after further success with local children), she moved into the bottom floor of the hotel. The first official evaluation of Sister Kenny’s work took place in Townsville in 1934, under the auspices of the Queensland Health Department. Her success working with polio victims led to the establishment of Kenny clinics in several cities in Australia. The Sister Kenny Clinic in the Outpatients Building of the Rockhampton Base Hospital is now listed on the Queensland Heritage Register. In the late 1930s, following a failed attempt to promote her treatment methods in England, Kenny returned home to find that support for her method had waned. She closed her Australian clinics but received an award at Brisbane General Hospital, where she was permitted to treat a subset of polio patients. Kenny set up a temporary treatment center for providing polio treatment in 1932 behind the Queens Hotel in Townsville. The Queensland Health Department conducted the first evaluation of Kenny’s work in 1934 which led to setting up many polio clinics in Australia. In spite of obstructions from doctors, she began treating a patient in his acute stage in her George Street clinic. Later the patient recovered completely in the Polio clinic located in Ward 7 of the Brisbane General Hospital. Between 1935 and 1940, Kenny traveled extensively throughout Australia, helping to set up clinics. 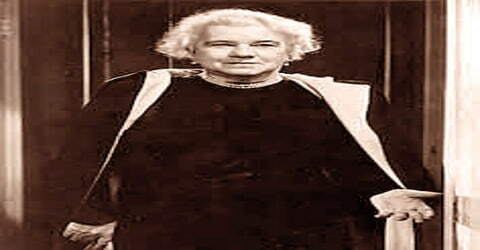 She also made two trips to England, where she set up a treatment clinic in St. Mary’s Hospital near Carshalton Kenny’s success was controversial; many Australian doctors and the British Medical Association (BMA) questioned her results and methodology. Raphael Cilento, who was in charge of the QHD evaluation, wrote a report that was somewhat complimentary but mainly critical. Kenny replied publicly, fiercely taking Cilento to task for his criticisms, unheard of then from a self-taught Australian Bush Nurse. This response caused a contentious relationship among Kenny, Cilento, the BMA and the Australian Medical Association (AMA). In 1938 the ‘Queensland Government Royal Commission’ brought out a report criticizing Kenny’s treatment methods. Its most critical comment, because Kenny opposed using splints and plaster casts were: “The abandonment of immobilization is a grievous error and fraught with grave danger, especially in very young patients who cannot co-operate in re-education.” They stated that her clinic (then in Brisbane) was “admirable”. The Commissioners’ strongest objections were against the Queensland government, which was funding Kenny’s work because her clinics were not supervised by BMA. But the Queensland government rejected the report and carried on supporting Kenny and her clinics. 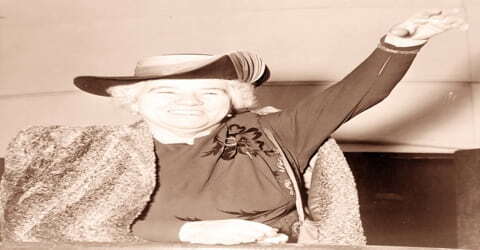 In 1940 Kenny managed to secure support from the Queensland government for a trip to the United States, seeking endorsement there for her method and eventually being given space at the Minneapolis General Hospital for her practice. In 1942, backed by the confidence of her American colleagues, she opened the Sister Kenny Institute in Minneapolis, and the Kenny method earned wide acclaim. Kenny subsequently became one of America’s most admired women of her era and was given honorary degrees and invited to deliver talks. In a 1943 letter to the British Medical Journal, Kenny noted that “there have been upwards of 300 doctors attending the classes at the University of Minnesota”. During this time several Kenny treatment centers were opened throughout America; the best-known was the Sister Kenny Institute in Minneapolis (now Courage Kenny Rehabilitation Institute), a facility in the New Jersey Medical Center and her favorite, the Ruth Home in El Monte, California. She received honorary degrees from Rutgers University and the University of Rochester. She joined U.S. President Roosevelt (a well-know polio victim) for lunch, discussing his treatment at Warm Springs. In 1951, Kenny headed the Gallup’s most admired man and woman poll most-admired women’s list, the only woman in the first 10 years of the list to displace Eleanor Roosevelt for the #1 spot. The Sister Kenny Foundation was established in Minneapolis to support her and her work throughout the United States. In addition, despite the celebration of her work in the United States, her efforts were largely ignored by the Australian medical community. Her institute in Minnesota remained in operation following her retirement to Australia in 1951. Later, however, the Kenny method received little attention, mainly because polio vaccines proved enormously successful in disease prevention. In recognition of her work, in February 1950 President Harry Truman signed a Congressional bill giving Kenny the right to enter and leave the US as she wished without a visa. This honor had only been granted once before, to French marquis Gilbert du Motier, Marquis de Lafayette, who was a leader in the American War of Independence. Elizabeth Kenny received honorary degrees from the ‘Rutgers University’ and the ‘University of Rochester’. In April 1925, Kenny was elected as the first president of the Nobby branch of the Queensland Country Women’s Association. In 1951 her name topped the list brought out by ‘Gallup Polls’ as the ‘most admired woman’. Elizabeth Kenny died of Parkinson’s disease on November 30, 1952, in Toowoomba, Queens, Australia. Her funeral was held on 1 December 1952 at the Neil Street Methodist Church in Toowoomba and was recorded for transmission in other parts of Australia and in the United States of America. The funeral cortege from the church to Nobby Cemetery was one of the largest seen in Toowoomba. 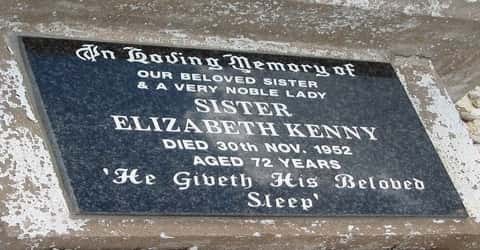 Kenny was buried beside her mother in Nobby Cemetery. Between 1934 and her death in 1952, Kenny and her associates cared for thousands of patients, including polio victims throughout the world. Their testimony to Sister Kenny’s help is part of her legacy, as is The Kenny Concept of Infantile Paralysis, and Its Treatment (known as the “Red Book” and written by Dr. John Pohl in collaboration with Kenny). Kenny recounted her life and work in And They Shall Walk (1943; written with Martha Ostenso). She also wrote Infantile Paralysis and Cerebral Diplegia: Methods Used for the Restoration of Function (1937), The Treatment of Infantile Paralysis in the Acute Stage (1941), and The Kenny Concept of Infantile Paralysis and Its Treatment (1943; cowritten with John F. Pohl), all of which provided detailed descriptions of the Kenny method. My Battle and Victory: History of the Discovery of Poliomyelitis as a Systemic Disease (1955) was published posthumously. The Sister Kenny Memorial House was opened in Nobby on 5 October 1997 by Prof John Pearn. The memorial house contains many artefacts from Kenny’s life, a collection of documents from her private correspondence, papers and newspaper clippings. In Toowoomba, the Sister Elizabeth Kenny Memorial Fund provides scholarships to students attending the University of Southern Queensland who will dedicate themselves to work in rural and remote areas of Australia. In Townsville, her life was commemorated in 1949 by the unveiling of the Sister Kenny Memorial and Children’s Playground.